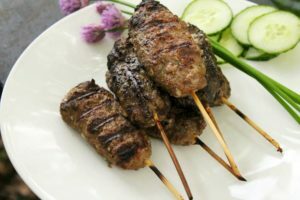 A simple, yet flavorful Beef Kofta Kebab, perfect for grilling outdoors and sharing with family and friends. A healthy and filling meal when served with some rice pilaf, and fresh salad. 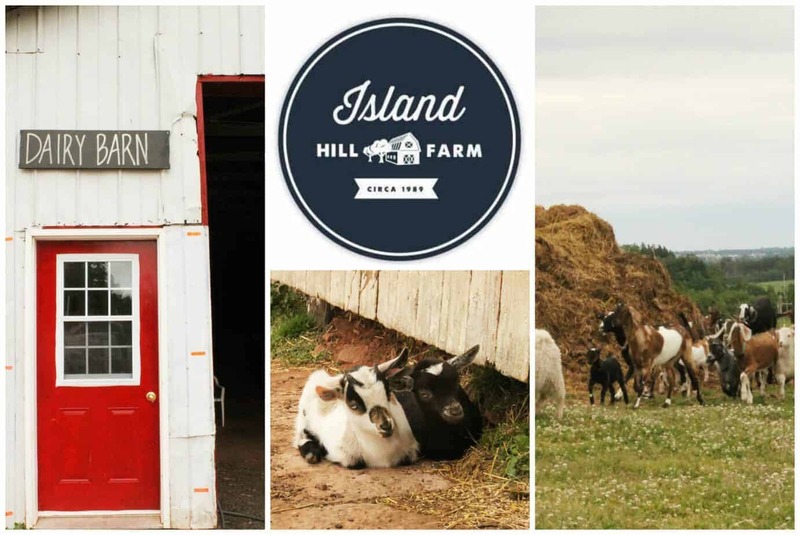 I was first introduced to Middle Eastern food by my father who would take us to a small local Turkish restaurant in downtown Halifax. It was only wide enough to accommodate one isle down its length with tables on either side, of which there couldn’t have been more than fifteen. The kitchen was located at the back, so every time a waitress would come out of the kitchen with plates piled high with rice, house salads, kofta kebabs and other delicious smelling meats, you couldn’t help but stare eagerly at the food hoping it was destined for your table. Of all these flavors and dishes, Beef Kofta is probably my favorite. Aromatic, and full of flavor, kofta kebabs always packs a mouthful of delicious meat. 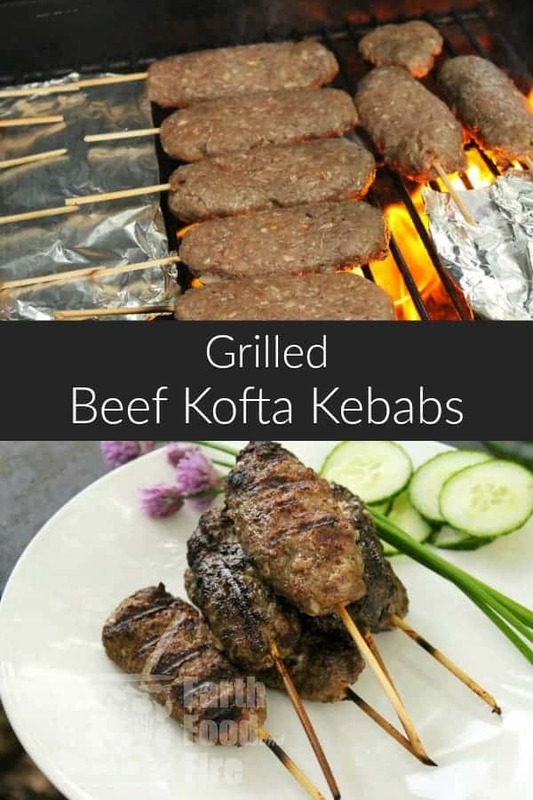 Whether its Lamb, Beef, or Chicken, making a kofta kebab recipe at home is very simple. This recipe can easily be thrown together and cooked for a quick filling supper, served with pita bread tzatziki and homemade hummus. As you can see most of these ingredients are spices, and you could easily combine them in a jar labelled “Kofta Kebab Spice” for even faster meal prep. Mix all your spices, herbs and egg with the ground meat and mix it together with your hands. Really mix it through and make sure that the spices are evenly distributed. Set the meat aside(covered and in the refrigerator to follow safe food practices of course). Shape the ground spiced meat into 2.5-3 inch cigar-shaped rolls, and then insert a skewer into one end until it goes through the length of the “cigar”. Don’t poke it out the other side though! 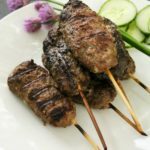 Brush these skewered kebabs with a little bit of olive or canola oil to prevent the meat from sticking to the cooking grill. 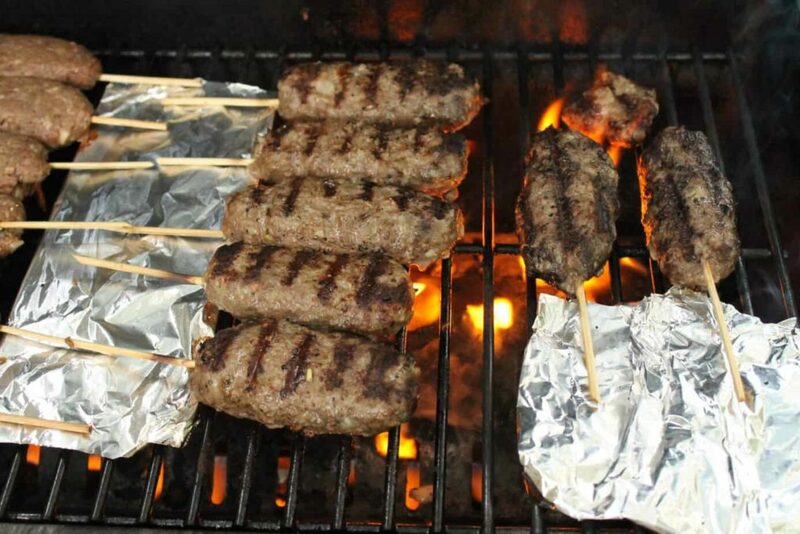 As soon as the grill is nice and hot, you can place the Beef Kofta Kebab right on the grate. You should hear a nice sizzling sound. If the meat starts to drip a little, turn down the heat (over a fire, spread out the coals to cool them down) to prevent the fire or BBQ from flaring up and charring the skewers. 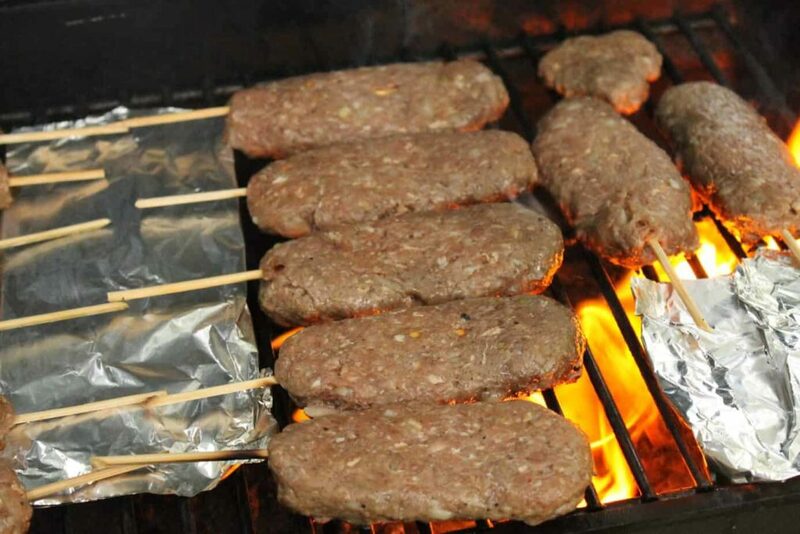 Even though you soaked the wooden skewers to prevent them from burning, you can take a sheet of tinfoil and lay it over a section of grill that is not as hot. Over this strip of tinfoil, place the wooden end of the kebab, to help ensure char free handles! Turn the skewers until they are a nice golden brown on both sides. You can use a food thermometer to ensure the internal temperature reaches 165F for a fully cooked skewer. You can also keep a close eye on the meat, and once you see the juices starting to run out clear, the meat is cooked through. All that’s left is enjoying the delicious Kebabs! They make great finger food and are easily stacked on a plate and garnished with some cucumber and parsley! Aromatic, and full of flavour, beef kofta always packs a mouthful of delicious meat. Whether its Lamb, Beef, or Chicken, making kofta at home is very simple. 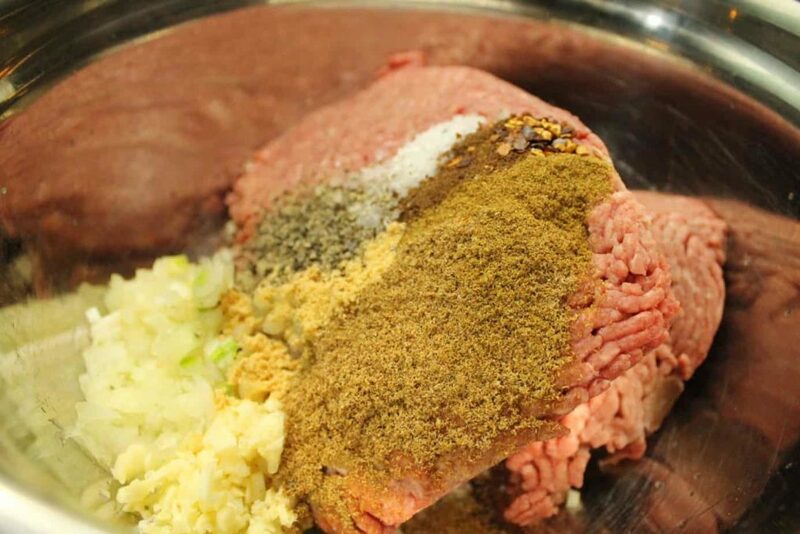 Mix the ground beef with the spices, herb and egg. Shape little 3 inch long cigar shaped rolls with the meat, and skewer them with a wooden skewer. Grill the kebabs over a BBQ or Fire until golden brown and cooked all the way through, about 10 minutes. What a great meal for grilling! 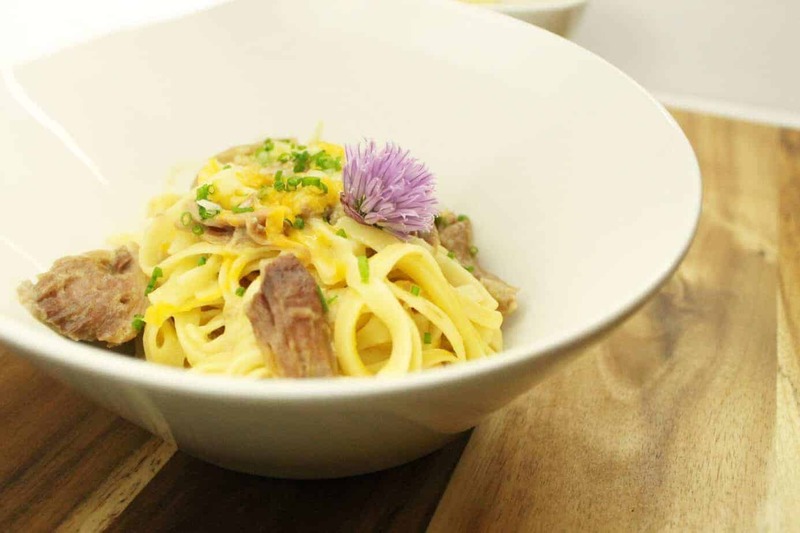 A great main dish to pair with summer side dishes. It is! The beef kofta are easy to make ahead of time as well, and freeze great! Love the flavors! And perfect for grilling season!! Grilling out is the best. Sharing this with my mother in law! She was just asking me to search for kabob recipes! Perfect! These are so delicious, I’m sure she will love the recipe! We love middleeastern flavors.. and all the spices that goes in a kofta. I love this, Markus! And I love that you got to be exposed to Turkish food at such a young age. I come from a small town with very little culture, so I didn’t get to experience Turkish food until I moved here to Raleigh, NC. Very nice! My husband and I were just talking about trying this at home. I am super excited to give this a try, fingers crossed for this weekend. I have been looking for a nice soft fresh pita recipe to go along with it. I love middle eastern flavours, and we certainly like lamb. With grilling season in full swing, these look and sound totally delicious!